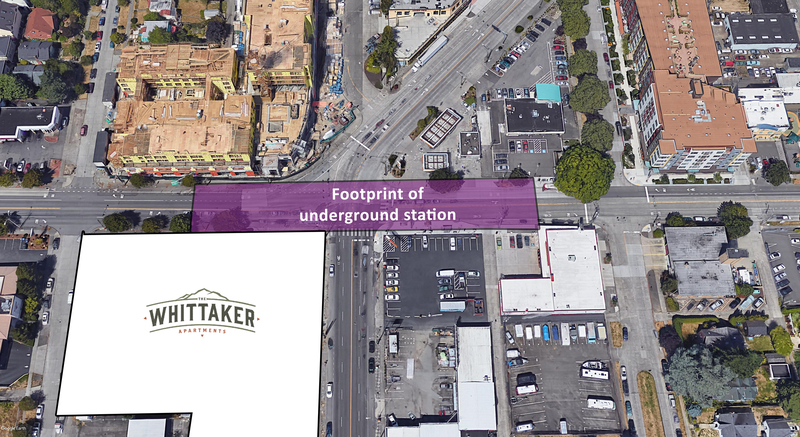 One of the underground station tunnel footprint options for light rail in West Seattle. This is a concept illustration based on the latest data from Sound Transit by Tomasz Biernacki. To tunnel or not to tunnel? Sound Transit plans to extend light rail service to West Seattle by 2035, and currently community activists are debating the pros and cons of a particular alternative: putting in a tunnel. Seattle residents are familiar with tunnels. In 2011, voters decided to tear down the Alaskan Way Viaduct in favor of a tunnel. This will allow Seattle's waterfront to be more urban living friendly, complete with beaches and attractions, so people can enjoy the waterfront without the noise and eyesore that SR 99 created. Tomas Biernacki member of the Junction Neighborhood Organization (JuNO), said that a tunnel will enable strong light rail service, with minimal impact to residents during and after construction. Biernacki said that the light rail extension will be a huge, multi-year long project. We must keep quality of life high throughout and after this period. "Once built above ground, you lose a lane of traffic because the columns are about 10 feet wide," he said. This can make it troublesome for streets to accomodate bike lanes and pedestrians, which can lead to saftey concerns. Biernacki also noted that that if the rail is built above ground, that could displace housing developments. Even after construction, without the tunnel, quality of life might suffer, he stated. "There would be countless more affected later by the train operational noise," he said. "Think of all the rental units at the Whitaker or the Spruce. The train would run 40-50 feet in the air right along these units, every six minutes. Think of all the residential homes along Oregon or Genesee. This would change the character and quality of life in West Seattle for thousands of people forever." If the extention is put below ground, however, the tunnel construction "will only affect a handful of homes that will be needed by Sound Transit," he said. "I think a tunnel represents a more eloquent approach and addresses all the concerns much better than the above ground options." Biernacki added that the major drawback to the tunnel is cost, and currently there is no projected price tag. Chas Redmond, member of the West Seattle Transportation Coalition (WSTC) agrees that there are many pros to putting in a tunnel, including saving above-ground streetscape, and potentially making it easier to extend light rail further south. It could also serve to lower the guideway through Delridge, which now is as high as 150 feet. Additionally, many people have expressed preference for a tunnel. However, Redmond said that regardless of which alternative becomes the winner, the light rail extension project will enhance the lives of millions. Interested in getting involved and making your voice heard? Contact Sound Transit to offer your input at 206-903-7229 or wsblink@soundtransit.org. Also, consider joining the West Seattle Transportation Coalition — visit westseattletc.org or https://www.facebook.com/westseattletc. NOTE:If you have any questions specifically regarding these renderings please feel free to contact Tomasz Biernacki at 707-339-1144 or tomasz@pechara.com. These are unofficial images, not associated with Sound Transit. The images are based on the latest (April 16th 2018) drawings from ST that identify the 5 alternatives. The drawings available from Sound Transit are not very detailed and are a work in progress making it hard to produce a perfect simulation at this point. Our attempts to acquire higher resolution drawings or CAD from ST have not been successful.